This is the age of information – too much information, some say. With unlimited, round the clock access to news, facts and advice, it’s easy to lose sight of goals and plans and get lost in the endless stream. 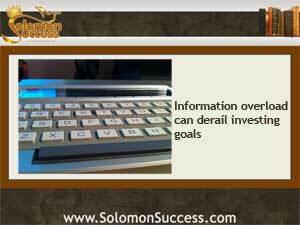 For investors today, King Solomon’s virtues of prudence and wisdom have never been more important for staying focused on investing goals and long range plans. Having access to too much information can actually reduce efficiency, say some investing experts. And they’re backed up by a body of research on decision making and focusing that suggests that information overload can paralyze critical thinking functions and throw carefully defined goals and plans into chaos. Here’s how. People with access to unlimited information on a topic may not know when to stop searching. There’s always one more website to visit, one more expert to consult, one more forum that might have the answer. You can check the Bloomberg stock reports at 3 am if you want – and all the others as well. Then there’s good old information overload. With so many apps claiming to be the solution to your problems, how do you decide which is right for you? With so many websites responding to your search, where to do you begin? Who can you trust? The brain freezes when faced with the mountain of information generated by a single search. Evaluating the information that’s available becomes another overwhelming task as well. Everyone is an expert, promising the best service, most authoritative information, and the best prices. Some users, frustrated and intimidated by too many conflicting choices, simply grab the first that comes along in order to avoid trying to figure it all out. The solution? Take control of the information before it takes control of you, say experts on finance and investing. Create a plan for your investing life, with clear goals, and stick to it. Don’t’ let yourself get derailed by too many “gurus” claiming to have the answer. Eliminate cyber-clutter, too. Prune your apps folder and keep only the ones that help you reach your goals. Limit online searches and make regular visits to a few trusted websites that, again, match your goals. If you find other interesting information, bookmark it and visit when you have free time. Think carefully about what you read. If it sounds too good to be true, it probably is. Don’t let yourself be intimidated into buying every investing course or book that shows up n your inbox because it promises the expert’s answers. Jaffe, Chuck. “Delete All Your Investing Apps Now.” Marketwatch. MSN Monee. MSN.com 20 Jun 2013.